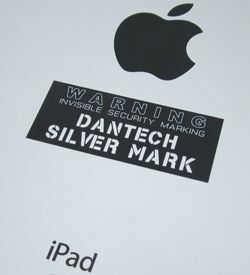 Secure, Track and Identify your assets and equipment with ID MARK security marking system, ID plates and asset labels from Dantech. identification as recommended by the Police and insurance companies. Conforms to Home Office Guidelines by using your name and postcode as a way of identifying your property – this also helps with item recovery in case of theft. Dantech has produced millions of ID Mark stencils over the years and supplied to local Authorities, NHS, educational establishments – even the police as well as thousands of companies. Need to protect equipment with a shiny surface like an iPad? Try our ID Silver Mark with UV marking. 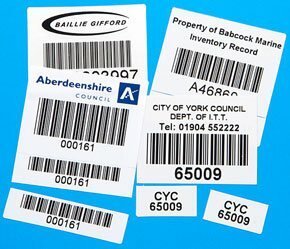 easy way to record and identify your valuable equipment with your name and individual numbering. personalised with your name/logo as well as sequential numbering/barcode.